Having a workout plan will help your arms get stronger and firmer, but it will do very little to get rid of the fat in the arms. According to the American Council on Exercise, spot reduction is not possible; strength-training exercises help you build firmer muscles but they don't burn fat just on the arms. By reducing your calorie intake and performing aerobic exercises, you can reduce your overall body-fat percentage, which will improve the appearance of your arms. Perform aerobic exercises daily to burn fat. The Centers for Disease Control and Prevention (CDC) recommends at least 150 minutes of moderately intense cardio exercise such as brisk walking weekly or 75 minutes of vigorously intense cardio such as playing basketball or swimming laps every week. Five minutes of vigorous exercise is equivalent to 10 minutes of moderate-intensity cardio. Therefore, you can perform 10 minutes of vigorously intense cardio daily or 20 minutes of moderately intense cardio. Build your biceps with weight training. The biceps are the muscles at the front of your upper arms. Building both your triceps and biceps improves the appearance of your arms, even in the presence of fat. Perform exercises such as biceps curls, hammer curls or concentration curls. Aim for six to 12 repetitions for muscle growth and perform three to six sets. Exercise your biceps three times a week on non-consecutive days. Reduce your overall caloric intake. 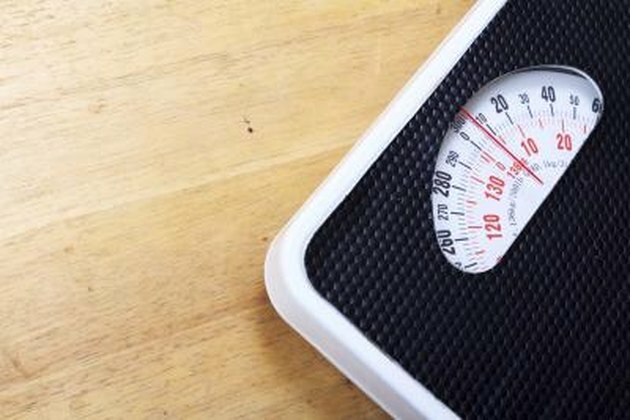 According to the CDC, people who lose between 1 to 2 pounds per week have greater success in keeping the weight off. One pound of weight is equivalent to 3,500 calories; therefore, reduce your calorie intake by 500 to 1,000 calories daily for 1 to 2 pounds of weight loss weekly. By reducing your overall body fat and increasing lean muscle mass, your flabby arms will be replaced with toned muscles. Perform full-body workouts. Build your chest, abs and leg muscles to boost your resting metabolic rate. Consume lean protein such as salmon, complex carbs such as brown rice or pasta, fruits and nuts by choosing whole food ingredients. Avoid baked goods, confectioneries and instant meals, which are often high in calories, sodium and sugar. Consult a physician before starting an exercise program.